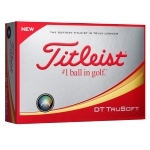 Titleist Velocity two-piece golf ball with a soft and very fast core and thin NaZ+ cover for a fast initial velocity and extreme low spin for maximum distance on all full swing shots. • soft and very fast core with LSX technology delivers high initial ball speed and extreme low spin for maximum distance on full swing shots. • thin NaZ+ cover blend increases initial ball speed and reduces spin for extra length. 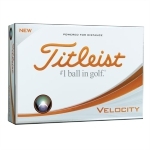 • Velocity side stamp helps aligning your golf ball and promotes better putting accuracy. 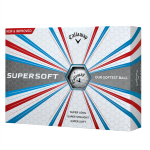 Take your game to the next level with the Tour-ready Chrome Soft golf ball from Callaway Golf. The Chrome Soft has combined a new distance-boosting core design with the feel you have come to expect out of a high-quality performance ball. The Dual Soft Fast Core has been created to maximize distance off the driver, while reducing spin for shots around the green. The core also features a graphene layer between the inner core and cover to allow for higher levels of compression. Higher compression provides more distance, even on off-center hits. The soft Tour Urethane Cover combines with the SubMantle to provide you with a feel suitable for any professional. The cover also saves key strokes by producing the spin needed to help balls land soft from the higher irons. 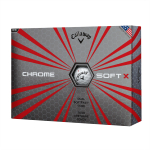 The Callaway Chrome Soft X golf ball has been created to provide a piercing, workable ball flight without sacrificing any of the short game performance that has made it so popular. Callaway have developed the stronger ball flight by using a combination of their HEX Aerodynamic dimple pattern and an advanced Tri-onomer mantle design that will regulate the spin on each club in the bag. The longer clubs have less spin for more carry and the shorter clubs have more spin for enhanced feel and superior control. An ultra-thin Urethane cover helps generate exceptional high levels of short game spin that will enable you to maximise short game shot-making precision. New Tri-ionomer™ cover formulation increases softness for better feel and more shot-stopping wedge spin. 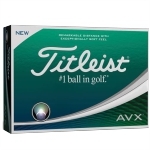 Callaway Warbird 2.0 Golf Balls For The Bomber Who Wants To Rip It Off The Tee The Warbird 2.0 golf ball reduces drag and promotes a stronger, more penetrating ball flight that cuts through the air like a jet. Only instead of a tarmac, a tee serves as its launching pad. Its destination, that's up to you, but one thing's for sure, with HEX Aerodynamics™ and a fast core, it'll fly a long, long way. 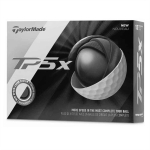 Updated for 2019, the Taylor Made TP5 Golf Ball is better than ever, with new technology to improve performance for this popular Tour ball. With a softer feel than the similar TP5x, the TP5 features a lower compression rating, less short game spin and a lower launch. With 5-piece construction from Taylor Made, the TP5 can maximize ball speed without forfeiting control from workable spin. The Tri-Fast Core used in the previous model is designed to enhance ball speed while the Dual-Spin Cover uses durable urethane for reduced drag and a soft feel. The primary new technology included in the TP5 is Taylor Made’s Speed-Layer System. This consists of four gradually stiffer layers to make the most of golfer head speeds for a longer carry off the tee and a straighter trajectory in the wind. Also featured in the 2019 TP5 is a brand-new material from Taylor Made called HFM (High-Flex Material). Designed to boost ball speed by increased rebound off the club and off the ground. 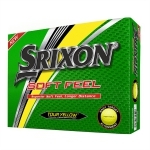 Keep your long distances while at the same time getting a great feel from Bridgestone's Extra Soft Yellow Golf Balls. They provide forgiveness from their revamped Extra Soft gradational core. Their softness continues with a great feel from the Extra Soft ionomer cover. 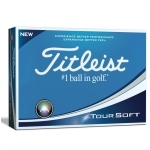 Many golf balls on the softer side sacrifice distance for feel, but Bridgestone’s Extra Soft doesn’t. 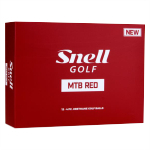 Engineered for golfers who demand maximum performance with exceptional control. 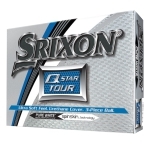 The Srixon Z-Star golf balls deliver unmatched technology with incredible feel so golfers can elevate all aspects of their game to score better. The new 338 Speed Dimple Pattern utilized five different dimple sizes to improve the relationship between uniformity and occupancy for longer, more efficient flight. The new SpinSkin™ Coating has fewer bonding points. It stretches across more of the club face at impact, increasing friction for even more spin. The result is significantly more spin on critical approach shots. Lower compression Energetic Gradient Growth Core provides even softer feel on all shots and improved launch conditions for more distance off the tee. Engineered for golfers who demand maximum performance with exceptional distance. 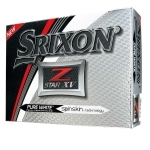 The Srixon Z-Star XV golf balls deliver unmatched technology with incredible feel so golfers can elevate all aspects of their game to score better. Redesigned Dual Energetic Gradient Growth Core provides even better launch conditions for category-leading distance off the tee. 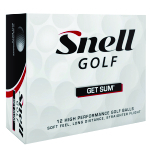 Generic blank 2-piece construction golf balls white, no manufacturer name on the ball. Bright white cover, allowing for superior imprint quality. Bulk packaged. We also offer clear plastic boxes (one ball per box or 3 balls per box). 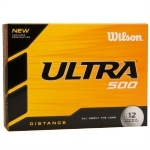 At the heart of the Wilson Ultra 500 Distance ball is a high-energy titanium core that creates impressive initial velocity upon impact and sends shots flying. 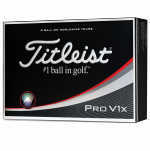 When you're looking to get a long and straight shot to lower your score, this ball is bound to deliver. Embedded into the surface of this ball is a 432-dimple ionomer cover that follows through on keeping your shots high and long. In addition, the aerodynamic cover is scuff-resistant, keeping your equipment looking newer for longer.